Lights are incredibly functional – they add brightness to dark spaces and help you see clearly during the night hours. But did you know that they can also be fun? These novelty lights are perfect for adding color, joy, and an ambient glow to your home. Whether you’re a fan of light boxes, neon lights, night lights or more – we’ve rounded-up 30 of the most amazing versions that you can make yourself. Fancy creating a DIY light to celebrate the festive season? This crafty snowflake marquee light from A Beautiful Mess is just the thing you need! Bring some fun into your workplace by creating this DIY letter marquee light from A Joyful Riot! The step-by-step instructions make it so simple. Relive the nostalgia of circus animal cookies by creating your own DIY novelty light version! A Joyful Riot will show you everything you need to know. You can also create a DIY flower-filled frame that serves as a light – isn’t that wonderful? Anne or Shine has this fantastic YouTube tutorial for you. Does it get any better than these DIY paper dinosaur lamps? You can find out more about their assemblage and the crafty kits via Apartment Therapy. A Practical Wedding will show you how to make not one, but two, DIY neon light signs! This one features the word ‘Love’ and is perfect as a wedding decoration. Here’s the second DIY version from A Practical Wedding – a neon quote saying ‘Love like hell yeah!’. What a great statement piece for any wall! This wreath-inspired novelty light features lots of colored balls and fairy lights – it’s ideal for adding color and light to any room! Don’t miss the full tutorial from A Subtle Revelry. We love this DIY pretzel marquee light from Aww Sam – is there anything that blogger can’t do? What a great talking-point this would be! Speaking of Aww Sam, here’s another one of her crafty creations, this time featuring a DIY heart-shaped lightbox. We’d love one of these on our desks! Add a bright flash of lightning to your space with this DIY light from Brenda Bird Designs. Children and adults alike are going to love this one! Brit + Co have created this gorgeous and gold hanging light – it’s a very modern take on the traditional chandelier! You’re sure to love the easy-to-follow tutorial too. How cool is this DIY flamingo light from Brit + Co? To think that you can actually make it yourself too – does it get any better than that?! Cool Creatives will show you how to create this amazing DIY cloud light. It isn’t hard to see why this pin has gone viral on Pinterest! It’s amazing what you can create using plastic spoons! Craft Foxes has actually made this DIY pineapple light – how fun! Delightfully Tacky had a much-loved but old globe that broke, so thought she’d turn it into a DIY light. That’s so clever! Create your own enchanting mushroom lights by following this video tutorial from DIY Perks via YouTube. Children will love seeing these in the garden! These ampersand marquee lights have become very popular of late, so why not make your own? By following this tutorial from Happiness Looks Good on You, you’ll save yourself a small fortune! I Spy DIY has created this crafty and quirky DIY neon light. It’s shaped like a lightbulb for extra cool-factor! Another lighting and home décor trend to sweep the internet are these lightboxes that you can add letters to, but they can set you back a decent amount of dollars. Instead, we recommend following this tutorial from I Spy DIY to create your own! The great thing about this DIY neon light is that it looks wonderful both in the day and when turned on at night – it’s a true work of art! Don’t miss the insightful tutorial from I Spy DIY. Bring peace, flowers, and plenty of light into your home this festive season (or all year around) with this stunning DIY idea from Lisa Loria. It really is a masterpiece in its own right! Got an old, but treasured retro camera at home? Why not turn it into a lamp that you can use and admire for years to come, thanks to this DIY project from Lovely Etc.? We adore this idea! If you don’t think you have the craft or DIY skills to pull off any of the lights featured previously, fear not! This DIY project from Maize Hutton requires very little crafty skills – you simply place a string of lights into a swan planter. Too easy! 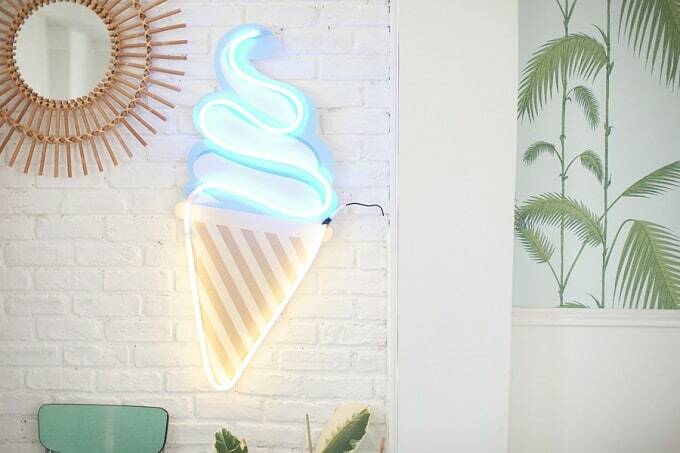 Can you imagine having one of these DIY neon ice cream lights in your home or workplace? We’d love one! Make My Lemonade is the clever blogger behind this tutorial. Here’s a DIY light that you might want to cuddle! Matsuke Blog has created this adorable fox light and we have a feeling you’ll love it. This DIY ‘yay’ marquee light from ModCloth is the perfect accompaniment to any party – would you agree? The gold coloring makes it super stylish too! Infuse your home with some stylish cacti décor, just as Shrimp Salad Circus has done with this DIY neon cacti light. This is a quick and easy project too! How adorable is this DIY kitty light from Sirlig? We’re surprised by how easy it is to create too – perfect! There you have it – 30 fun DIY novelty lights you can make yourself! Which ones were your favorites? We’d love to hear from you in the comments section below!